Having a Lore-Master in here is very very very helpful. Tactical damage as well is very key to the final fight. Or having Westernesse damage on your main weapon. Upon entering the instance, you fight the first two Kergrim, just interrupt as necessary. When you come down the stairs be careful to not get into melee range of the Limrafn. If you have aggro on the Limrafn and get in melee range of it, ghosts will spawn, they can be 3 elites or 1 elite master. It is totally random. 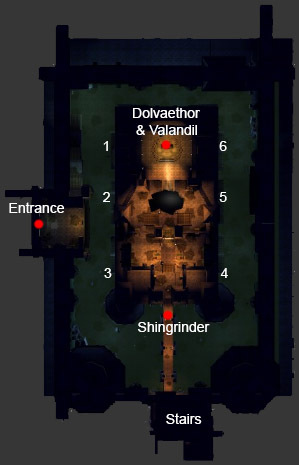 There are 6 chambers in the center catacomb. Some have statues with swords, you can bypass these (there will be three of them) and move on until you find an open one. Go in and kill everything. Once the Wight dies and the brazier is lit, a message will appear on the screen then it is ok to move on to the next one. The Lore-Master's AoE wound/disease clear is crucial throughout this entire first part, be sure they have it traited. Once all "6" braziers have been lit the pathway to the top is opened up. Shingrinder has a punt he does so people can fly over the side and die or if lucky live with a 1 minute leg break. Most groups sprint through to the other side of the bridge, if someone lags behind they get punted. 99% of the time no one gets punted. Once Shingrinder comes into the group just burn him down. After Shingrinder is dead move up to the stairs there will be fire Limrafn with 100% reflect. Do NOT use any big attacks. You will kill yourself. The fire Limrafn will come for a while then the firewall will go down. Move up for endless waves of wights. They hit hard and have a lot of health. Just endure. After a wave or two, the two Morlendil Guards will activate, switch all DPS to the Morlendil Guards. They have a nasty knockback so try and have your back to a wall. Once the waves end and the Morlendil are dead, it is time for the final fight. If you have ever seen Dragonball Z, you will get the reference. For the DBZ fans, he does a flamethrower Kamehameha attack, it needs interrupted asap it does a lot of damage. It is heal intensive as well. Valandil takes little damage from anything but tactical (fire/light oil works) or Westernesse damage. Challenge is to kill them within 10 seconds of each other. Burn Dolvathaer quick but the most important thing is interrupting him as soon as he goes for his attacks. When Valandil gets low enough he goes green and walks slowly to the middle then falls dead. When Valandil's animation begins kill Dolvathaer quickly and congrats you completed challenge!